Around the world, most traditional diets are rooted in healthy plant-based meals. Just take a look at the Oldways Mediterranean, African, Asian, and Latin American Pyramids—all of them feature fruits, vegetables, grains, nuts, and legumes as their foundation. Yet today, plant-forward meals can raise a common concern among diners: is it possible to get enough protein on your plate without meat? The answer is a resounding yes! To prove it, Meatless Monday is partnering with the Johns Hopkins Center for a Livable Future. 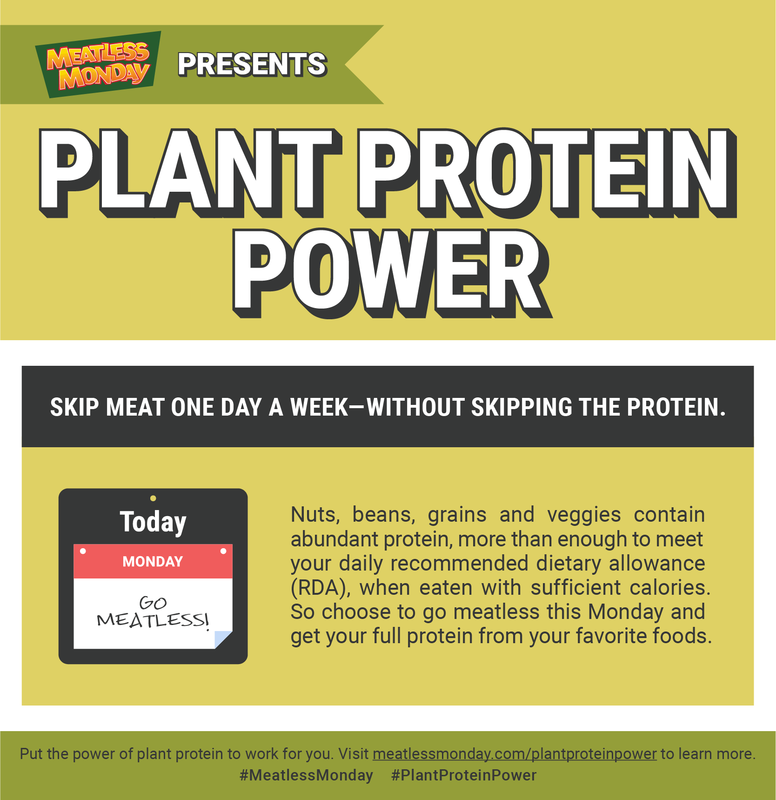 Their #PlantPowerProtein campaign shows that meatless meals are part of a healthy and balanced diet. What do we mean by “plant protein”? An abundance of beans, vegetables, nuts, and seeds fall into this category. Read on for the top ﬁve reasons to make room for them on your plate! With plant protein, you get a bigger nutritional bang for your buck. Many plant proteins (like beans, chickpeas, nuts, and seeds) oﬀer beneﬁcial nutritional properties, in addition to protein. Walnuts, for example, contain omega-3 fatty acids, ﬁber, and vitamin E. Or, consider that one cup of beans provides as much protein as two ounces of beef, with the added beneﬁt of being cholesterol-free. Although meat does provide protein, excessive consumption is associated with raised LDL cholesterol, clogged arteries, and risks such as heart disease, diabetes, and cancer. Choosing plant protein in place of meat lowers the risk of these potential health problems. Some people worry that plants don’t provide “complete” protein, or protein that contains all the amino acids that your body needs. Although not every plant protein is complete in itself (for example, grain foods are higher in the amino acid methionine, while legumes and soy foods are higher in lysine), the liver can store amino acids, so it’s not necessary to worry about “combining” complementary protein foods at every meal. By eating a varied diet with diﬀerent types of plant foods (grains, legumes, soy foods, etc. ), you can make sure that your body is getting the proper amino acid balance. Rice with beans, hummus with pita bread, and peanut butter with whole wheat toast are three examples of complete protein combinations. Meat production can take a heavy toll on water, land, and fossil fuel supplies. Plant-based foods are less draining to natural resources. Save water, conserve energy, and reduce greenhouse gas emissions by making the switch to plant protein at least once per week. Beet Burgers in a whole-grain pita pocket are a high-protein meatless meal. Recipes with plant-based proteins are varied, fresh, and delicious. Check out a few of our favorites below, or browse our vegetarian recipe collection or 4-Week Vegetarian & Vegan Menu Plan. It’s time to embrace #PlantPowerProtein! I’m so happy to see this here. I did notice that you said there was no need to worry about food combining to make a complete protein, but then went on the show some examples of good food combinations. I think this gave the impression, again, that it is necessary to eat beans with rice, for example. Plant protein is complete and there is no reason at all to worry about getting enough protein as long as you are eating enough calories. Eggs and cheese are meat. Just saying. Hi Ed, thanks for your comment! While some people might choose to limit all animal products in their plant-based meals, some of the vegetarian recipes here do include cheese and eggs. If you'd like to visit our recipes page, you'll find more plant-based meals that are dairy- and egg-free.